Great sage Sutha was explaining in detail birth of Lord Ganesha and why one should not see the moon on that particular day to Sounaka and other rishis(sages). Once upon a time, there was a demon king called Gajasura (in the form of Elephant). He prayed to Lord Shiva very religiously and Lord Shiva was very pleased with his prayers. Lord Shiva is considered easily accessible to his devotees and he would appear in front of Gajasura and tells him that he would grant any boon he wishes for. Gajasura then says “Lord Shiva, I wish that you stay in my stomach all the time!”. Shiva would agree and would enter his stomach and starts living there. Gajasura’s stomach. But she couldn’t figure out how to get him out from there. Finally, she would approach the protector, Lord Vishnu and explain the situation to him in detail. Vishnu would then console her and send her home. ” I will give whatever you want” and immediately Vishnu would say ” This is Shiva’s vehicle Nandi came in search of Shiva; So, if you can giveShiva to us, we will be happy”. Then he would give permission to Vishnu to take his life. Nandi would then tear apart his stomach with it’s horns and release Shiva. He then would leave for Vaikuntham(Vishnu’s place) and Shiva would then head back to Kailash. Parvathi created Ganesha out of sandalwood paste that she used for her bath and breathed life into the figure. Lord Shiva fixed the head of Gajasura he brought along with him in place of Ganesha’s head and gives him life again. He would then name him “Gajanana”, (Anana means face and Gaja means elephant) hence the name Gajanana, the elephant-faced-god. Gajanana was also very devoted to his parents and he used to serve them with utmost respect. His vehicle was a mouse named “Anindya”. After a while, Shiva and Parvathi had another child named “Kumara Swamy” or “Murugan”. He was very strong and his vehicle was a peacock. One day, all the Gods, Humans and Sages pray to Lord Shiva and asks him to provide a ruler of all Vighnas(obstacles). Being the elder sibling, Ganesha request that he should be given that opportunity and since he is stronger, Murugan(Kumara Swamy) requests that he should be that ruler. Shiva then tells both of them “Between both of you, whoever can take a holdy dip in all the holy rivers in the three worlds(lokas)(Heaven-the cosmic, Pathala-under the earth and Earth) would get the throne”. Kumara swamy would immediately get on his vehicle, peacock and speeds away. Gajanana goes slowly and sadly to his father and says ” Father, you know about my personality and knowing that, you have given such a task. I am mere mortal at your service, please let me know a way”. Shiva then says ” if you can recite Narayana Manthra(Ohm Namo Narayanaya) and make three rounds around your parents, you would get the benefit of taking a holy bath in all the holy rivers in the entire universe”. Ganesha would do the same and due to the powerful nature of this mantra, Kumara swamy would see as if Ganesha had taken a bath ahead of him in river Ganges ahead of him and so on in all the 3.5 crore rivers. Kumara swamy would be astonished by this and return back to Kailash and pray to his parents and then say, “Father, ignorant of brother’s powers, I was arrogant. 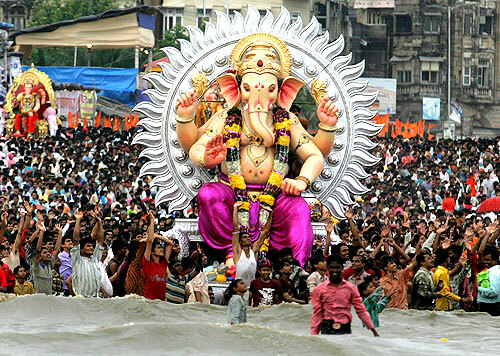 Please grant the ruling powers of Ganas to Ganesha”. Hence, on the day of Bhadrapada Suddha Chathurthi, Ganesha would be given the throne to the Ganas. All the people in the entire universe would make Kudumulu, Undrallu, Kolukattai, Panakam, Vadapappu etc., to him and pray to Lord Ganesha. Ganesha would be extremely pleased and he would then eat some and give some to his mouse(Anindya) and by dusk, return back to Kailasam. When he tries to bend down to bow to his parents, his big belly would touch the ground but his hands could not reach. When he tries to touch the ground with his hands, his feet would go up in the air. He would be struggling like this and the crescent moon on Shiva’s head sees this and laughs. Due to evil effects of the Drishti , Ganesha’s stomach would burst open and all the Kudumulu etc., would roll on the ground. Ganesha would then die. Parvathi starts crying and would look at the moon and says, ” you evil moon, because of your evil eye, my son died. If anyone sees you, they would become sinners and will be blamed for no reason; this is my curse”. During the same time, Saptharishis(7 sages in Indian mythoology) were performing a homam(a ritual where fire is lit up on the middle). Agni, the God of Fire gets attracted to the wives of these sages and in the fear that he would be cursed, fire would be diminishing day by day. Fire’s wife is “Swaaha devi” and she notices this and she would take the form of all the Sages’ wives except Arundhathi who is Vashishta’s wife. Rishis will see Swaha devi and believe that it is their own wives and they get angry. Due to the curse of Pravathi, this thing happened. So, all the sages and gods will inform Brahma, due to his immense powers sees what had happened and let the rishis know and also all of them will bring Ganesha to life. Shiva and Parvathi will be extremely happy to see Ganesha alive and Parvathi will relax her curse to “On the day when moon laughed at Ganesha , only on that day, noone should see the moon”. So, all of them will be very happy with this and will go back to their homes being careful not to see the moon on Bhadrapada Shudha Chathurthi day. During Dwapara yuga, Narada visits Krishna in Dwaraka and pays his respects. During their conversation Narada reminds Krishna , “Oh lord, it is evening time, today is Vinayaka Chathruthi, due to Parvathi’s curse, don’t see the moon. I am going home, please let me take leave” and explains what happened in the past and leaves to heaven. Then Krishna announces in his entire town of Dwaraka not to see the moon. Being milk lover, Krishna goes into his cattle farm in the evening without looking at the moon and starts milking the cows. At that time, accidentally he sees the reflection of the moon in the milk and wonders, “oh my, what kind of trouble am I going to face now!” After few days, Sathrajith gets a boon from lord Surya and gets a diamond called Syamanthaka and pays a visit to Krishna in Dwaraka. Sri Krishna invites him royally and during the conversation, asks him to gift him the diamond. Sathrajith says ” no fool will gift a diamond away that gives out 8 tons of gold a day”. Sri Krishna will keep quiet. One day, Sathrajith’s brother Prasena goes to jungle for hunting wearing this diamond and a lion spots him and thinks that it is a piece of flesh. The lion kills him and takes the diamond and while it is running away, a bear spots the lion and kills the lion and takes the diamond and gifts to his daughter, Jambavathi as a play toy. Next day, Sathrajith hears about his brother’s death and announces that Krishna killed his brother because he wanted the diamond and stole it. Then Sri Krishna realizes that this is due to the ill effects of seeing the moon and takes his army and friends and goes into the jungle to get the diamond back. There he sees Prasena’s body and lion’s paw prints and follows the paw prints and finds the dead lion and then the bear’s foot prints. He follows the bear’s footprints into a cave where he finds the little bear playing with the diamond; when Krishna takes the diamond and was returning back, the little girl(bear) Jambavathi starts crying seeing the strangers. Hearing this, Jambavantha come angrily and attacks Krishna and they both fight for 28 days. Finally Jambavantha becomes weak and realizes that the person who defeated him is no one else but Sri Rama during Thretha Yuga. He says” Oh God! oh savior ! I just realized you are Sri Rama during your last incarnation. due to my foolishness, when you asked me to wish for something, I wished for a fight with you and you said it will be fulfilled. Now you came to my house to fulfill that. I am going to die soon, please save me” Then Krishna will run his hands all over Jambavantha’s body and all his wounds would magically disappear. Krishna would then explain to him the situation and asks him to give the Diamond and Jambavantha gladly give the diamond and his daughter also to Krishna. Krishna returns to Dwaraka and calls Sathrajith and gives his diamond back to him. Sathrajith realizes his mistake and feels extremely sorry and gives the diamond back to Sri Krishna and gives his daughter “Sathyabhama” and begs forgiveness. One fine day, Krishna would marry both Sathyabhama and Jambavathi. All the people would then come to Sri Krishna and say”Oh lord! you are a God and you cna easily get rid of the blame, what about us normal people?”. Then Krishna will say, ” On Bhadrapada Sudha Chathurdhi, if you accidentally see the moon, worship Lord Ganesha, listen to this story and take the Akshathas(rice) from the puja and keep on your heads and you will not be blamed”. Everyone will feel happy about this and will go back to their houses and on this day, worship Ganesha with great respect and concentration. Sutha mahamuni explained this story and the background details to Sounaka and other saints and went back to his ashram.